The biggest news story of the week was the completion of the Trans Pacific Partnership negotiations. As noted in the Business Council statement (link), it was essential that Canada be part of this landmark trade and investment agreement which covers 40% of the world’s economy. While there were concessions by all nations involved, the CBC’s Terry Milewski notes that the disaster anticipated by the Canadian agricultural and auto sectors has not materialized. 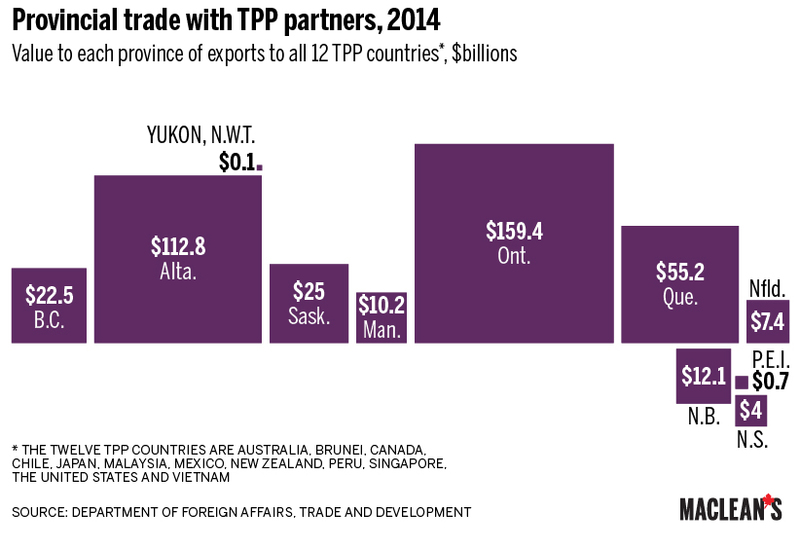 According to this infographic published at Macleans.ca, the value of BC’s export activity with the 12 TPP countries represents $22.5B. The US House of Representatives have voted to lift the ban on oil exports that has been in place since the 1970’s. Industry representatives noted that this will “level the playing field for US workers and businesses who should be allowed to compete against foreign oil suppliers like Iran and Russia” and will allow for “an extra dollar or two for the price of our product” during a time of low oil prices and low margins. The White House has expressed their intention to veto should the bill come to the President’s desk, however it is not anticipated to pass the Senate. US Energy Department analysis estimates American refineries’ profits could be $22B lower by 2025 if the ban is lifted. The Economist updated their house price index this week noting their belief that the Canadian housing market is 30% over valued. Their interactive chart looks at more than two dozen markets around the world and charts out several factors including price increases, the prices vs. rent and the prices against average income. On the latter, Canada ranks 3rd highest behind Belgium and Australia. Good news for renters however, Canada has the highest house prices when measured against rent, suggesting that renting may provide more short term value in the Canadian market. BC has added more than 46,000 jobs since September of last year; year-to-date employment growth, however, is still just 0.8%. As reported in Business in Vancouver, BC’s jobless rate is below Alberta’s for the first time since 1994.